A few days ago I had a whole day with no papers to grade, no housework to do... so what did I do? 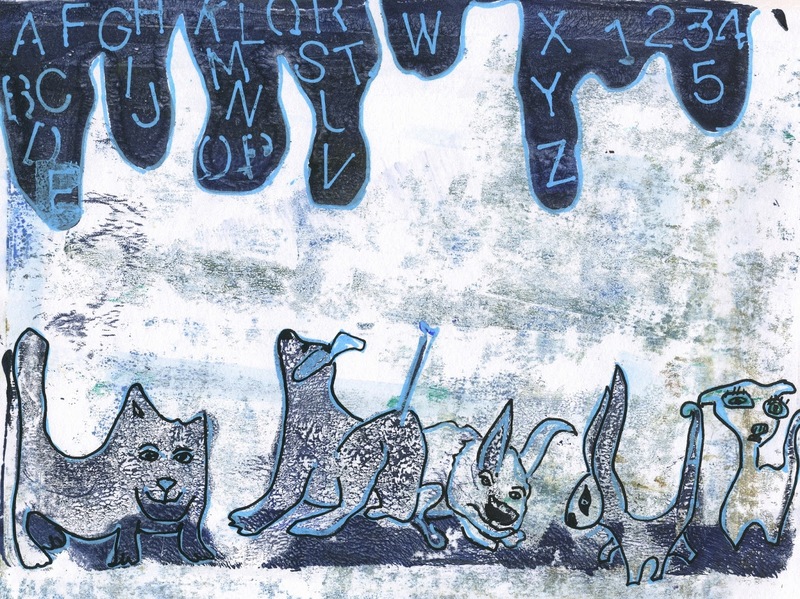 I pulled out the Gelli printing plate and messed around for hours! It was so much fun. The Gelli Plate is a tool for allowing people to make monoprints at home without a press. You can find out more (and see tons of cool demos) here. I like to make prints on single sheets of paper, but I will also just print into my current sketchbook. At the very least, this can give me an interesting background to work with. The think about monoprinting is that sometimes pictures are done quickly, after one or two colors are printed. Sometimes a piece takes more layers before it seems done. Sometimes, you aren't sure, so you just have to let it sit a while. And sometimes, blech. There are failures. Oh well. Paint over them. Or cut them up for collage. No worries. The print I want to share to day is one that only has two layers to it. That means I only ran two "prints" onto the paper before I decided to stop and work with it. I printed this directly into my sketchbook. I wish I had taken a scan of it before the animals started showing up. But the paint had barely dried and there they were, begging me to outline them so they could begin to take life! One of my favorite things to do is to find shapes, animals and characters from abstract, accidental marks on paper. I do it with watercolors a lot. But for some reason, this time it seemed magical. The five characters showed up, each with a distinct personality and with a voice I can hear in my head. Maybe I'm supposed to write a comic with them. Maybe that's why the letters and numbers are there. Anyhow, I used paint markers (I have Poscas) to outline the animals and to write in some alphabet stencils. Then, after that dried, I used matte medium to seal and protect the whole thing. I am wondering if I should cut it out of my sketchbook and frame it. I really like it! I should mention that I really learned how to use my gelli plate from a terrific online course I took with the delightful Carla Sonheim. You can learn more about her and all her online courses here. This is one of the best examples I can think of of what it means to scribble with spirit. It really is scribbling, in that when I put paint down on the gelli plate, I have a notion what is going to happen, but I don't really know for sure. And I can't control it. I just have to let it go and see what happens. And it's spirit when I sit back and look at the shapes and colors and think to myself, "Ok. What's there that wants to come out?" I don't really have a plan. And I don't really have an agenda. I just try to be present so that the art can come into the world through me. It's a different sort of presence and attention than when I am trying to draw something in front of me from life, but at the core, it is the same. Exciting. Adventurous. Meaningful. And connected to something beyond myself.